This topic describes a step-by-step example of promoting configuration from a development environment to a testing environment. If further promotions to more upstream environments are required, you can repeat Step 4 and Step 5 only. Note Some environments (for example, testing and production) might be exact copies of each other, which enables you to deploy the same environment package to both environments. In these cases, repeat Step 5 only. A domain is configured in the development environment with a group of API Gateways named Dev Payment API Group. A domain is configured in the testing environment with a group of API Gateways named Testing Payment API Group. The configuration developed in the development environment must be promoted to the servers in this group. The policy developer in the development environment uses Policy Studio to create policies, users, certificates, listeners, and so on as required for the business solution they are developing. The policy developer will edit and deploy the configuration to the Dev Payment API Group repeatedly until they are finished with the configuration. Select the Group and API Gateway instances to which to deploy the configuration, and click Deploy. This uploads the configuration to the Admin Node Manager for the group, and then deploys it to the API Gateway instances on the hosts. Note This simple example shows a group with a single API Gateway instance. Groups will typically have multiple API Gateway instances. If some Node Managers in the group are not running, do not select the API Gateways on those hosts, and you can still deploy to the other hosts in the group. When the policy developer is developing policies in an iterative manner as described in Step 1, they might choose not to consider what settings are environment-specific yet, or they might choose to environmentalize these settings as they go along. Either way, before promotion can occur, all settings that are environment-specific must be environmentalized to prepare the configuration for promotion to upstream environments. You must first enable the display of configuration settings that are assigned for environmentalization in Policy Studio. Select Window > Preferences > Environmentalization in the main menu, and select Allow environmentalization of fields. The policy developer edits the database connection, Connect to URL filter, HTTPS interface, and LDAP connection. You can click the Environmentalize icon (globe icon on the right of the fields) as shown in the following examples. Alternatively, press Ctrl-E to environmentalize a selected field. Tip You must give the field focus before the Environmentalize icon is displayed. When configuration settings have been environmentalized, the corresponding node in the Policy Studio tree is displayed with a globe icon and bold text. Assuming the policy developer has already entered values for the fields that they have selected to be environmentalized, these values are automatically specified under the Environment Configuration >Environment Settings node. To update the setting values for the development environment, you must use the Environment Settings tree node. To disable environmentalization for a setting, you can right-click its node in the Environment Configuration > Environment Settings tree, and select Remove. This also deselects the field in the window used to edit the configuration setting (for example, database connection). The value configured before environmentalization is displayed again. Alternatively, you can click the Jump to configuration link, and return to the window used to edit the configuration setting, and deselect the Environmentalize icon on this field, or press Ctrl-E. This also removes the field as a setting to be configured under the Environment Settings tree. The value configured before environmentalization is displayed again. After all environment-specific fields have been selected, and appropriate values set for the development environment, the policy developer should deploy and test the updated configuration. For details on deploying to the group, see Step 1: Policy developer edits configuration and deploys in development environment. The deployment package (.fed) deployed to the Dev Payment API Group will contain the entries in the environment settings store, and the associated values suitable for the development environment. Configuration fields that point to other fields are known as reference fields. For example, in an HTTPS Interface or XML Signature filter, you environmentalize a reference to an X.509 certificate. You can also environmentalize references to complex types such as authentication repositories. If a reference to an authentication repository is environmentalized, you could set the repository to the local user store in the development environment, and to an LDAP repository in the testing environment. The standard way to environmentalize a certificate at group level is to click Environmentalize on its configuration window. Environmentalizing a certificate, or any other reference field, is the same as all other fields. For example, when you environmentalize the signing certificate in an XML Signature filter, the Environment Configuration > Environment Settings tree where you enter environment-specific values displays a node for the XML Signature filter. The window on the right includes a Signing Key button to display a list of available certificates. 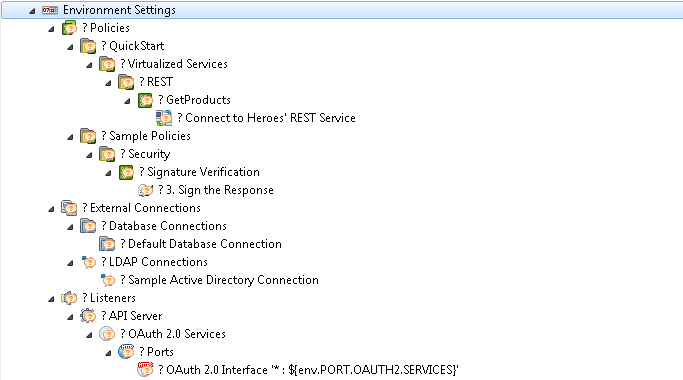 You must select one of these certificates in Configuration Studio or Policy Studio. This field will most likely be prepopulated in Policy Studio if you already selected a certificate before clicking Environmentalize. Alternatively, you can environmentalize a certificate using an alias. For example, in the development environment, the XML Signature filter could use a certificate named MySigningCert. The policy package (.pol) created from the development environment must be merged with an environment package (.env) that contains a certificate with the same alias. Note You can also environmentalize certificates using an alias at the API Gateway instance level as described in Externalize API Gateway instance configuration. However, certificates are normally environmentalized at the API Gateway group level as described in this topic. When the active configuration is loaded, select File > Save > Policy Package. Note Before creating the policy package, Policy Studio automatically detects any unenvironmentalized certificate references, and enables you to automatically environmentalize these settings before proceeding. Browse to the directory in which to save the package, and enter its filename (for example, c:\temp\payment.pol). A policy package (.pol) file is created on disk. The policy developer must transfer this file to the testing environment using some external mechanism (for example, FTP or email). Note The steps described so far are the same for first and subsequent cycle promotions. For the first cycle, the policy developer will most likely use the default factory configuration as their starting point for editing the configuration. In subsequent cycles, the starting point will most likely be the existing configuration currently deployed to the Dev Payment API Group. This step depends on whether this is a first cycle promotion or a subsequent cycle promotion. Open a command prompt, and change to your Configuration Studio installation directory (for example, INSTALL_DIR\configurationstudio). Enter configurationstudio to start Configuration Studio. Enter or browse to the location of the Policy Package (for example, c:\temp\payment.pol). Note The Configuration Studio opens policy packages and environment packages by opening files available on disk. The administrator must ensure that the required files are available to the application. If this is a subsequent cycle promotion, the testing API Gateway administrator uses the Configuration Studio to open the policy package created in the development environment by the policy developer in Step 3. You must also open the currently deployed environment package for the testing environment. If you do not open the currently deployed environment package at this point, you might need to re-enter certificates and settings that you entered for the previous promotion. For subsequent cycle promotions, settings that are still required by the new policy package from the development environment, and that existed in previously promoted policy packages, will have values configured. Any certificates, keys, user, and user groups previously created will also be shown. Environment settings that existed in previously promoted configuration but are no longer required will be removed. New settings in the new policy package are listed with no value. Note You cannot add or delete environment settings using Configuration Studio. These are predetermined by the policy developer in the development environment. Note If a certificate reference has been environmentalized, such as in the Sample Active Directory Connection, you must create or import a testing environment certificate in Configuration Studio. This makes the certificate available for selection when the environmentalized settings are edited in the Environment Settings tree in Configuration Studio. Note You cannot edit the contents of the policy package file in Configuration Studio. When you have entered all the environment-specific settings for the testing environment, select File > Save > Environment Package in Configuration Studio. An environment package (.env) file is saved to disk. The testing API Gateway administrator takes the policy package unchanged from the development environment created in Step 3, and the environment package created using Configuration Studio for the testing environment created in Step 4, and deploys them to the Testing Payment API Group using API Gateway Manager or scripts. On the Dashboard tab, select the API Gateway group in the TOPOLOGY section. 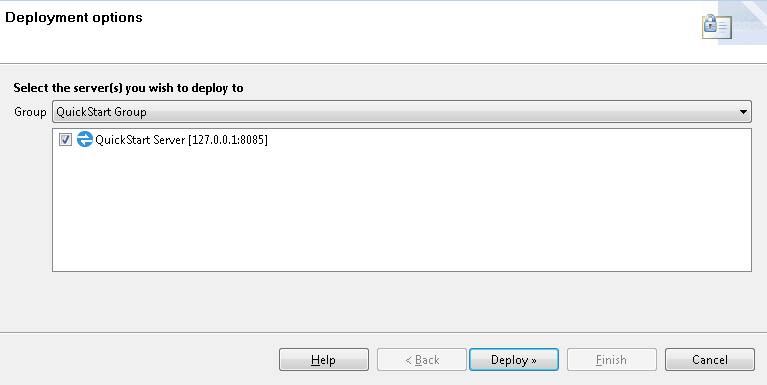 Click the Edit button on the right of the group, and select Deploy Configuration. Select I wish to deploy configuration contained in a Policy Package and Environment Package, and browse to the .pol and .env files. This section describes how to update environment-specific settings using Configuration Studio, and if necessary, using Policy Studio. If further updates are required to the environment-specific settings in the testing environment, the testing API Gateway administrator can open the policy package and environment package files in Configuration Studio at any time, and update the contents for the environment package file. The administrator can then deploy the policy package and updated environment package files to the Testing Payment API Group using API Gateway Manager or scripts. Normally the policy package will be promoted through to upstream environments without any updates. However, in some cases, a single policy package for all environments will not be possible. For example, you might wish to use different authorization filters in development and testing environments. But the policy developer might not have sufficient knowledge to create the necessary configuration for all upstream environments in the policy package. In this case, the API Gateway administrator in the upstream environment must use Policy Studio to make the required changes. The administrator will open a policy package from the development environment and the current testing environment package (if one exists) in Policy Studio, before making the testing environment-specific updates to the configuration. The administrator can save a policy package (.pol) and an environment package (.env) from Policy Studio. They can deploy them as usual to the Testing Payment API Group using API Gateway Manager or scripts. Alternatively, they can save a single deployment package (.fed), and deploy this package.